The Spring 2019 Career Fair is just one day away! Tomorrow from 1 to 4 pm, 300 professionals from over 100 companies will be in the Bentley Arena ready to meet YOU! While I’m sure you’ve been preparing all semester for this, here’s a comprehensive checklist for your final day of preparation! Get your Career Fair Fast Pass: Today is the last day for you to come to the Recruiting Office (LaCava 205) and obtain your Fast Pass to the Career Fair. Stop by with your student ID between 8:30 AM – 4:30 PM TODAY to get your name tag printed, receive a Bentley lanyard and your “Tips for a successful Career Fair” resource. All students need an updated name tag to gain entry to the Career Fair, so save yourself some time and stress on the day-of by stopping in today. You can also enter to win a pair of Apply AirPods! If you have already gotten your Fast Pass, please remember to wear it to the Career Fair for direct entry and to skip the lines! Head to this blog post for how-to instructions on procuring your Fast Pass. Download the Career Fair App: Simply head to the App Store or Google Play Store and search “the fairs app” and download. Then, follow the on-screen instructions to set up your account. Or, head to this blog post for how-to instructions and more! 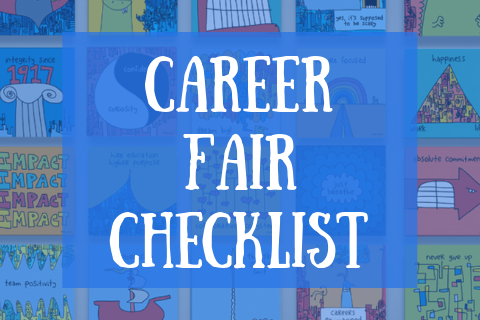 Read through our Career Fair Advice: We have a variety of content available for you! This Ask Alyssa episode will help calm your nerves and get you ready for the big day! This blog post is a great resource, as is this one! Refresh your resume and get it checked by a Career Colleague or Career Coach: Stop by LaCava 225 to grab our Resume Writing Guide and then use it to update your resume to reflect your most recent experiences and position yourself for success. Then, stop by our office to have it checked over! The student colleagues are in the office everyday from 1 to 2:30 for Sophomore drop-ins, and they’d be happy to take a quick look. If you’re a junior or senior and would prefer to have your designated career coach check it over for you, attend their drop-ins! Click here to view their drop-in schedules. Do your Career Fair Research and make a game plan of companies to visit: This is easy to do using our new app, or use our favorite resource, Vault. Be thorough, but don’t stress because the most important information that you should be talking about is yourself and how the company will benefit from hiring you! But it is important to know baseline information about the company, happy researching! If you need some Vault support, here’s a helpful Career Tool Thursday! Prep your ‘Dress for Success’ Business Professional Attire for the Career Fair: Business Professional is a must for this event, check out our guide for more information on the do’s and don’ts of what to wear! We also have this great infographic to help you properly navigate your closet. Print 10-15 nice copies of your resume and put them in your Bentley Pad-folio: The library should have printers set up with card stock later this week, if not you can easily run to Staples and have them printed for you, pretty inexpensively! Practice your elevator pitch and rest up! You may even want to practice your handshake, as that is a major key to success. The “Career Fair Shuttle” buses (2) will continuously transport students between upper main campus and the Bentley Arena. The “Career Fair Shuttle” buses will pick up attendees at the LaCava, Miller, and Trees designated “Shuttle Pick Up” locations and shuttle students to and from the Arena. Please look for signs to direct you. Bring several hard copies of your resume to network with different companies. Research companies you will visit: view company web page; view BentleyLink to see what jobs or internships they may have already posted; and think about your network–maybe a friend interned there or you know someone who works there. If a company has not stated they have a job or internship in your desired functional area, you can still stop at the table to ask questions about the company, the culture, and to see if you can learn a contact name from the area of the company in which you would be interested. If you are interested in the company, then show your interest – but if there is a line behind you keep it brief and move on. Networking is an integral part of your career from now through all future jobs, so get started and have fun—remember, these company representatives are coming to Bentley because they want to meet Bentley students! Please review jobs and internships in BentleyLink to ensure you do not miss any important application deadlines. We have over 300 industry representatives coming to the Career Fair, and we do not collect business cards; you will need to get the name and contact information of the people you speak with if you want to follow-up. Companies will use the email and cell phone number you provide on your resume, so please make sure your voicemail is set up and professional. Please ensure your voicemail storage is cleared out and has room for messages. Check your email and make sure important communications from employers are not going into spam. We hope you find these helpful, be sure to check the @bentleyu Instagram for more preparation advice and tips! We will see you on Wednesday in the Bentley Arena between 1 pm and 4 pm. Remember, just be yourself!